ExecutiveBiz is pleased to name Mercedes LeGrand, Executive Director at Russell Reynolds Associates, as a recipient of its 2017 Top 10 GovCon Executive Recruiters Award. Mercedes LeGrand is a member of the Russell Reynolds Associates’ Technology and Industrial Goods Sectors. She focuses primarily on defense-related technology companies and associated market and leadership trends. She is based in Washington D.C. Prior to joining the firm, LeGrand was a Managing Partner at Watermark Strategic Advisors, a consultancy which connects emerging technology companies with federal government buyers specialized in security, defense and intelligence. At Watermark, LeGrand helped clients understand federal regulations and processes, advised on marketing and pricing strategies, provided access to growth capital and advised on merger and acquisition scenarios. 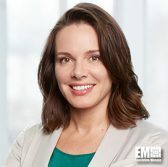 Before that, while at Booz Allen Hamilton, LeGrand served as Acting Director of Strategic Planning for the Department of Homeland Security’s Preparedness Directorate. Prior to that, she was an associate with D.C.-based investment bank, Friedman Billings Ramsey. LeGrand holds a B.A. in government and international politics from George Mason University and an M.B.A. from Columbia University Business School and London Business School.